We just saw a movie titled “Maudie,” about an artist who lived up in the far tippy northeast of Canada in Nova Scotia. Life was cold and harsh and Maudie was in ill health for most of her life. But that did not stop her from becoming a very well known painter. “What does this have to do with architecture?” you ask? 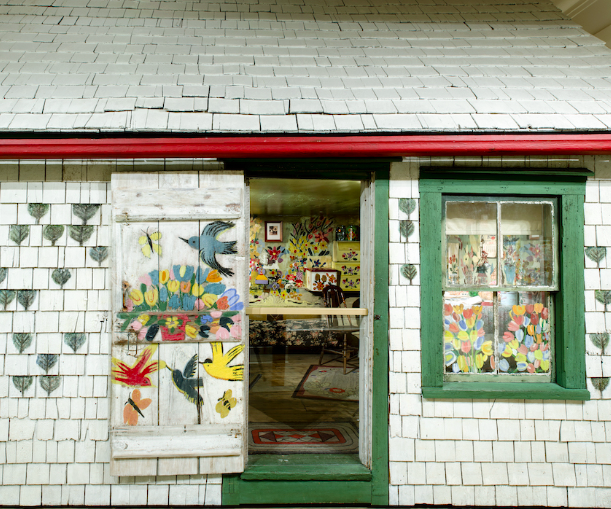 Maud Lewis, who lived from 1903-1970 in rural Nova Scotia, painted cards and she painted on wood planks, and she also painted on the walls and doors of her house. In fact, she seemed to paint on any surface that would accept paint. The imagery is not complex, but it is rich in storytelling detail and a sort of dreaminess. When she and her husband were both dead, the house itself was moved to the Art Gallery of Nova Scotia. Yes, the WHOLE HOUSE! Now it is true that it is a very small house, one room with a small sleeping loft above, but still – it is their whole house! Take a look here to see the house and maybe go to the movies and see “Maudie.” It is not a gun-shootin’, bad-guy-chasin’ kind of experience, but it does show a beautiful artist bringing beauty to life in a harsh place. 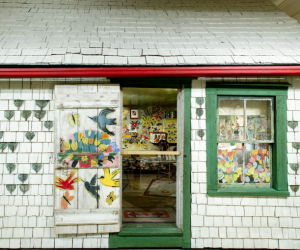 Find more information about a Maud Lewis art show at the Art Gallery of Nova Scotia. Here is a short video about Maudie made in the 1970s. *Photo from the website of the Art Gallery of Nova Scotia.